WASHINGTON, D.C. -- Most Russians are looking forward to the 2014 Olympic Winter Games that start in Sochi next week. Nearly half of Russians surveyed late last summer -- before recent security concerns cast a shadow over the games -- felt very positive about the Olympics, while 6% felt very negative. One reason for this positivity may be the development that comes with hosting an Olympics. Most Russians, particularly those in the South region where Sochi is located, believed the games would spur the development of roads, hotels, sport centers, and other infrastructure -- which it has done. Strong majorities among Russians overall also believed it would help promote sports development (84%) and improve Russia's reputation abroad (81%) -- although the games have been mired in controversy over human rights and environmental and security concerns. Many saw potential benefits for the region specifically, with 78% agreeing that the games will help promote tourism in the North Caucasus, home to the troubled areas of Chechnya and Dagestan. 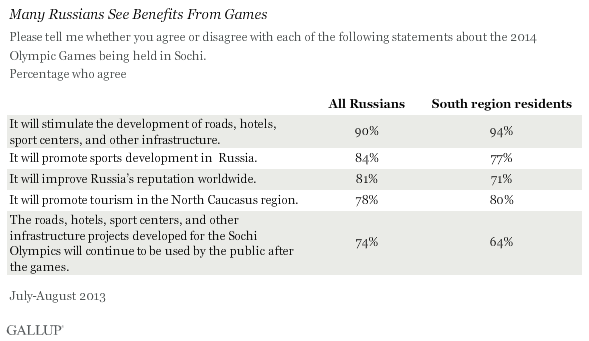 Residents of the South region, which includes the North Caucasus, also agreed that the Olympics would help tourism, although they were less optimistic about the prospect of the games promoting sports or increasing Russia's reputation. Concerns about corruption and costs related to the games temper these positive sentiments. Two-thirds of Russian adults feel that corruption will increase as a result of the Olympics, while 41% feel that the games will not pay off the money that has been spent on them. With total costs currently estimated at more than $50 billion -- much higher than the $12 billion in Russia's original bid -- the Sochi games will be the most expensive in history. Many of these concerns are amplified among those living in the area near Sochi. While one-third (33%) of Russians overall saw the Olympics as harming the environment in the region where they will be staged, the sentiment was higher (48%) among those living in the South region. Residents of this region were also more likely to see an increase in corruption and harm to the interests of local people as a result of the Olympics. The Sochi Olympics continue to be a source of controversy abroad, largely because of concerns about corruption, worker abuses at the venues, environmental concerns, and gay rights. 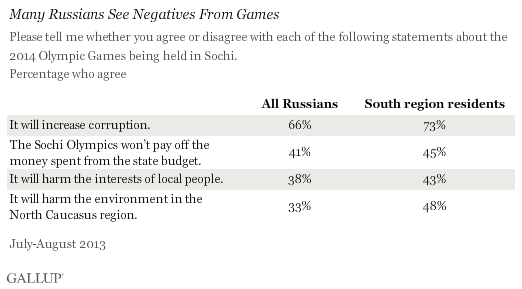 However, the strong support for the games among Russians appears to outweigh such concerns at the time of the survey. Although there is optimism in the nation as a whole, opinions are much less enthusiastic among residents of the South region whom the games will affect most. Results are based on face-to-face interviews with 2,000 adults, aged 15 and older, conducted from July 3-Aug. 8, 2013, in Russia. For results based on the total sample of national adults, one can say with 95% confidence that the maximum margin of sampling error is ±2.7 percentage points. The margin of error reflects the influence of data weighting. In addition to sampling error, question wording and practical difficulties in conducting surveys can introduce error or bias into the findings of public opinion polls.